Braving the Wilderness explores belonging, human connection and self-worth. 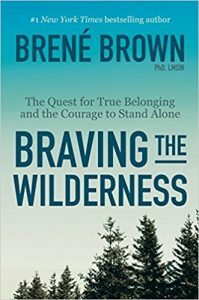 These are almost trademark themes for the author Brene Brown, and she achieves new heights here as exploration of belonging gets deeper and more meaningful than ever before. Braving the Wilderness is very wordy and unstructured. 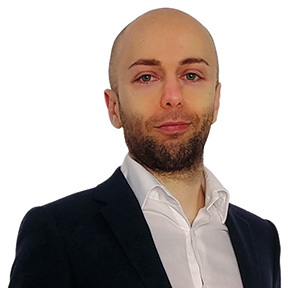 I will try here to give you a more structured summary of the main ideas and concepts. Belonging is one of our primary needs, and it can be deeply painful when we don’t find it. Brene Brown seems to know it well as she shares her childhood stories of not being welcome among whites and being only half-welcome among blacks. But when she’d show to her blacks’ classmates houses she could still remember, as a four years old, the shock of their black parents in seeing a white girl. But worst of all is when you don’t feel like you belong in your own family. Brene Brown desperately wanted to be part of the cheerleading squad. Her mom had been a cheerleader in that same school and her father a start football team. She practiced non-stop and went on a two weeks liquid diet. She actually excelled at her trial performance but was told she just wasn’t cheerleading material. Unluckily it wasn’t just the cheerleading team that Brown didn’t feel like belonging to. Her own parents voiced their disappointment and she felt rejected in her own family. That led Brown to drinking problems. She joined the AA anonymous and her sponsor told her she’d better go to Co-Dependent anonymous for better relationship (read co-dependent no more). But even there she was spurned. But Brene’s drinking problems and co-dependent relationships were only the symptoms of her internal wounds. There are many ways in which we can feel like we don’t belong. One of them is to be spurned by a group. But we can also feel like outsider when we join a group but don’t feel a connection with the rest of the people in the group. Or some other times we can self-loath for the opposite reason: for having tried so hard to belong and gain someone’s acceptance. True belonging happens when you stop trying to gain the acceptance of others. Fitting in means that you change yourself to be like the group you want to be part of. When that happens you won’t be experiencing real connection because you don’t show up being true to yoursefl. Belonging instead means accepting who you are, being who you are and having the people around take you for the real you. The spiritual practice of believing in and belonging to yourself so deeply that you can share your most authentic self with the world and find sacredness in both being a part of something and standing alone in the wilderness. Brene uses the wilderness because it’s both scary and tempting. The wilderness is what lies outside our comfort zone. It can be something new, something we are avoiding, or a place where are forced to confront our uncertainties and vulnerabilities. It’s different for everyone. It might require you to engage in introspection, spiritual learning or personal development. To keep going in the wilderness you must learn to engage in difficult conversations and motivate yourself not by fear, but by joy. And you will learn to trust yourself and others, and to show up as you really are: trusting and vulnerable. Both trust and vulnerability are qualities that we can all learn to develop. There was a time when we believed that the Internet was going to build a “global village” that would make us all closer and more united. Instead it only made it easier for like-minded people to stand with other like-minded people. It’s tempting to try to find belonging among those who think like us. But often the result is that it entrenches our ideas and might make us more extreme and bellicose. Brene Brown indeed makes the case that inside of groups of like-minded individuals we isolate ourselves from the world and we are all more lonely than ever. For true belonging, we need meaningful connections and not factions. When we hear people referred to as animals or aliens, we should immediately wonder, “Is this an attempt to reduce someone’s humanity so we can get away with hurting them or denying them basic human rights? We must never tolerate dehumanization—the primary instrument of violence that has been used in every genocide recorded throughout history. Stop walking through the world looking for confirmation that you don’t belong. You will always find it because you’ve made that your mission. (…) The truth about who we are lives in our hearts. Our call to courage is to protect our wild heart against constant evaluation, especially our own. No one belongs here more than you. Fitting in with this or that group won’t do a thing to make you feel better and more connected. You are much better off knowing yourself, and belonging to several different groups through human connection (VS a connection through ideology). What I learned and liked the most from Braving the Wilderness is that we should connect with people through human empathy and not through ideologies. Conjectures & Buzzwords Instead of Analyses: This Ain’t Research! The author often uses the term “research” in her writings. But this is not scientific research in the least. I personally very much dislike people trying to sell for research what’s not research. 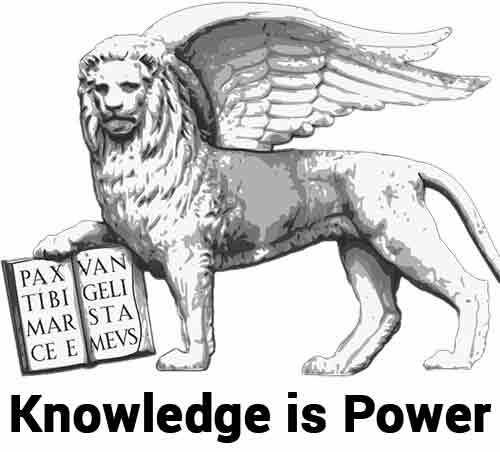 And research is not the ultimate truth, so there is no need to present our theories as research-based! Indeed I liked many of the author’s theories and conjectures and agree they’re valid for many cases. But it’s not scientific. Brene uses voting patterns to say that people have surrounded themselves with like-minded peers. She says that today 80% of Americans live in areas that overwhelmingly voted either for Donald Trump or Hillary Clinton. I wouldn’t consider that any valid set of data. Or she connects the bottling up of anger to mass shootings. But many other Western countries have the same culture as the US and don’t go on a shooting rampage (Brene as a hunter and gun owner might want to consider guns culture here). The author’s work often gives me the feeling to be a lot about “me, me, me”. It doesn’t have to be a con, she simply draws heavily from her experience in a way. Yet at times it feels as these books are self-therapy session of an entitled individual who’s showing off er success to te world. I don’t think it’s so relevant to tell us how much her husband loves her. Many of her readers might not find suc a man. And I didn’t think her personal story of success and Oprah’s appearances are very relevant for the audience for example. I have said the same on all other Brene’s books, including Daring Greatly and The Gifts of Imperfection. Accepting oneself to me is a double edged sword that might stop people from chasing their dreams and goals with the passion, drive and hunger that we sometimes need to succeed. By choosing of “selectively not accepting” where we are, we can muster more power on our side. And no, that does not mean we must lower your self-esteem. I don’t accept my current situation and have a very healthy self esteem. I am not particularly fond of the “wilderness” imagery, as if everyone was supposed to go into a dark and dangerous journey of self-discovery. One, not everyone’s path to self discovery will be wild. And two: why should it be so dark anyway? Brene Brown hits the nail on the head when she says that dehumanization has allowed the worst atrocities to happen. It’s a similar message in The Lucifer Effect, but I feel that Brown has gone more deeply than a book which was theoretically dedicated to exploring evil. Brene Brown’s Braving the Wilderness also presents a deep, engaging and powerful antidote to hatred and dehumanization. I can only wish more people will choose to heed this message because it’s life changing for you, me, us and the world. There is a part of me who loves Brene Brown’s work and a part of me who feels it’s goody-good over-analyzing which is specific to the author’s life and not highly generalizable. I think getting into Brene’s work to get the most out of it requires that people be selective for the great wisdom it contains while at the same time staying critical of what they should not pick up. For example in Braving the Wilderness I particularly loved the idea that you should belong to yourself first and foremost. That’s enlightening and it added a new layer of understanding of myself. It’s something I was unconsciously doing already but it gave me a new goalpost to strive towards. And it made me certainly a wiser man. But then advise on anger and extreme self-acceptance falls a bit flat on me (read: how to leverage pain and failure). Sometimes I have the feeling that Brene’s work might serve as a balm instead of fuel as for high achievers. Overall: great, great work. Absolutely recommended.